My little shepherdess watching her flock. All the things she's learning without even realising it. Makes all the highs, lows, late nights, missed work and grumpiness worth every second. As she stood there just watching I knew I had to take a picture! Best kind of learning I think, going in without really realising it! Great photo! What a lucky little girl she is! this might be the cutest photo i've ever seen! 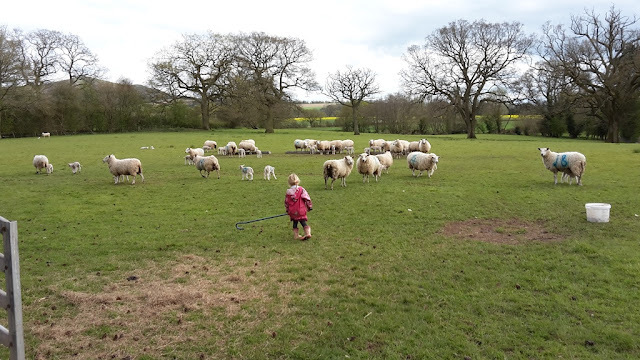 cute little Bo Peep:) It's great that she's given the chance to experience the real thing out in the open field...while we can only dream about it! Brilliant photo, what a lovely childhood you are giving them. How sweet is that. You are a very good dad to this precious little girl and her sister and brother. Brilliant photo. Immersing them in the country ways from this early age will make their lives so rich in knowledge that can only be gathered this way. A Speaker At Hellens Garden Festival!